The TTRF-250 determines the turns ratio of the transformer under test using the IEEE C57.12.90 measurement method. The turns-ratio range is from 0.8 to 50,000 to 1. Transformer turns ratio, excitation current, and winding polarity are displayed on the built-in 128 x 64 pixels graphic LCD screen. 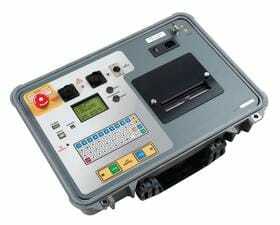 The TTRF-250 can be used as a standalone unit or can be computer-controlled. 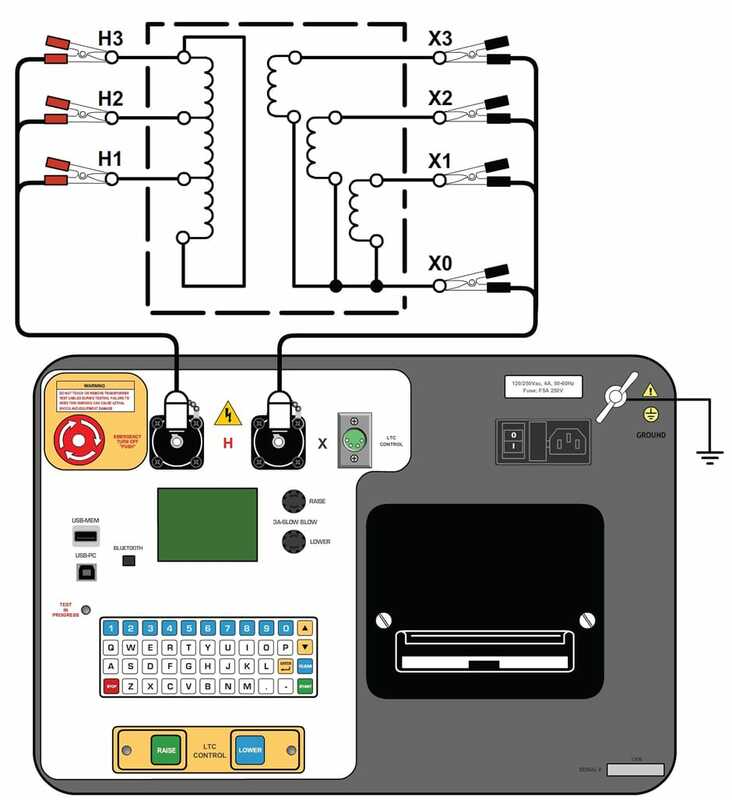 To prevent an accidental wrong test-lead hook-up (e.g., when the operator reverses H and X leads), the TTRF-250 outputs a low-level test voltage to verify the hook-up condition before applying the full test voltage to the transformer. Four test voltages (4 Vac, 40 Vac, 100 Vac, 250 Vac) allow the TTRF- 250 to test CT’s and PT’s, as well as power transformers. 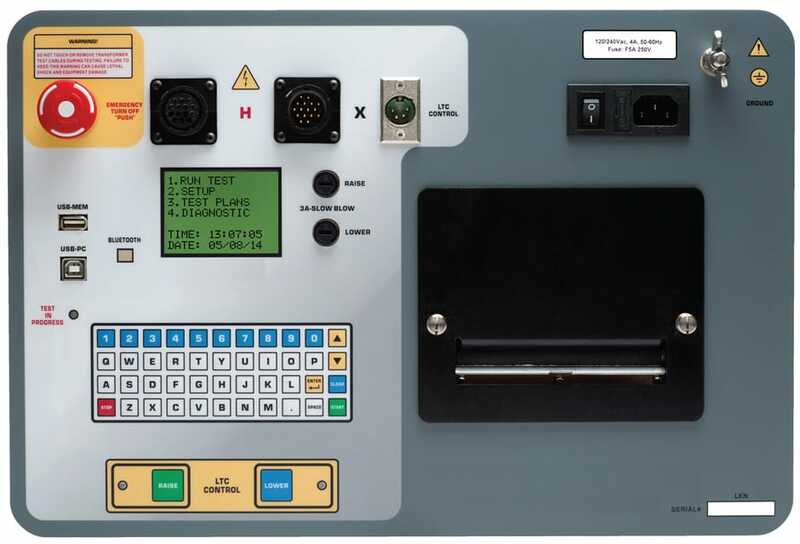 The TTRF-250 can automatically detect 130 specific vector groups for different transformer types defined by ANSI, CEI/IEC, and Australian standards. Up to 112 test records can be stored in the TTRF- 250’s Flash EEPROM memory. Each test record may contain up to 99 turns-ratio, excitation current, phase angle and nameplate voltage readings. Test records can be recalled locally or transferred to a PC via the available interfaces (Bluetooth, USB port, USB Flash drive port). The TTRF-250 offers an industry-first Bluetooth wireless interface along with an Android App that can be used to remotely control the unit. The TTRF-250 can store up to 128 transformer test-plans in its Flash EEPROM. A test-plan is comprised of the transformer nameplate voltages for each tap setting. The calculated turns ratio based on the nameplate voltages is compared with the measured turns-ratio to derive the percentage error and Pass/Fail results. By using a test plan, a transformer can be quickly tested and turns-ratio Pass/Fail reports can be reviewed. Test plans can be created with the PC software and can be transferred to the TTRF-250 via the available interfaces (Bluetooth, USB port, USB Flash drive port). The TTRF-250 features a back-lit LCD screen (128 x 64 pixels) that is viewable in both bright sunlight and low-light levels. The test results screen displays the transformer turns-ratio, excitation current, phase angle, and percentage error. The unit is controlled via a rugged, 44-key, "QWERTY"-style membrane keypad. In computer-controlled mode, the unit can be controlled via the Bluetooth or USB interface using the supplied PC software (Transformer Turns-Ratio Analyzer application provided with each unit). This Windows®-based application can be used to run tests and to store test results on a PC. Test results can also be exported to Excel, PDF, and XML formats for further analysis. The 250V test voltage provided by the TTRF-250 provides more accurate test results when measuring the transformer turns ratios of very large transformers with a built-in LTC. The three figures below show the turns ratio test results and corresponding percentage error of a 600MVA transformer with an LTC in the Lowest position using 40V, 100V, and 250V test voltages. At the 250V test voltage, the percentage error is less than 0.5% as specified in IEC 60076-1 and IEEE C57.12.00-2006-1 standards.